This is a question that every business owner faces in 2019 — whether you’re already using social media or not. 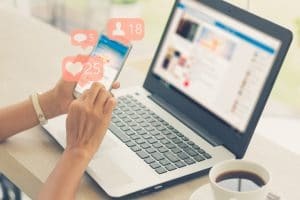 You may have heard about the benefits of social media, and you may already understand that you should be leveraging this tool to your advantage. Then the issue becomes a matter of implementation. Using social media the right way can increase traffic (online and in person) for your business and foster strategic relationships. It’s all about understanding the intended uses for these platforms. One of the most valuable aspects that social media platforms provide is a connection to your clients. Social media can operate as a feedback channel, giving you data about your practice. What do your patients like about visiting your practice? What could you improve about the experience? Receiving negative reviews or feedback can actually help you grow as a practice. Plus, when people share their glowing reviews about you online, it bolsters your reputation, making you a more attractive option for new patients. A strong social media presence can also increase online and in-person traffic for your business. Links back to your website from your social media channels funnel potential clients to your page. Staying active on social media can also help new clients find you online. When they see the services and care that you offer online, they’ll be encouraged to explore your dental practice for their next visit. No one will use your business if they can’t find you! Of course branding and consumer education are vital pieces of your social media strategy. You can create and manage the expectations of new clients before they even arrive at your practice by showing them who you are on your social platforms. Photos of staff members and facilities help new patients feel more comfortable before a visit, which increases the likelihood that they’ll have a good experience. You can also educate your patients with social media content. A post about the benefits of dental sealants for children, or the ease with which patients can whiten their teeth can introduce your patients to a new service that they’d like to try. If you want to start using social media, or improve the quality of your content, talk to MDPM Consulting! In addition to website design and SEO for websites, we also provide social media management services. We understand the dental industry, and we’re excited to help your practice grow. Talk to our office staff at MDPM Consulting in Dallas, TX about social media strategy by calling us at 972-781-8861.